The Tara Shrine Room was transformed into a conference room with a large chair for the Gyalwang Karmapa placed in front of the shrine and a table holding eight microphones, laid like flowers across the front. Facing him were rows of reporters, twenty in all, who had come to attend this joint press conference, covering both the ceremony commemorating the 16th Karmapa on February 14th, the day before, and the 33rd Kagyu Monlam which will begin on February 16th, the day after. Changdzo Karma Chungyalpa gave the reporters some background information and read the important message from the Chief Minister of Sikkim, which underlined the close historical connection of the Karmapas with Sikkim. The first question asked about the Karmapa’s activities in relation to the environment. 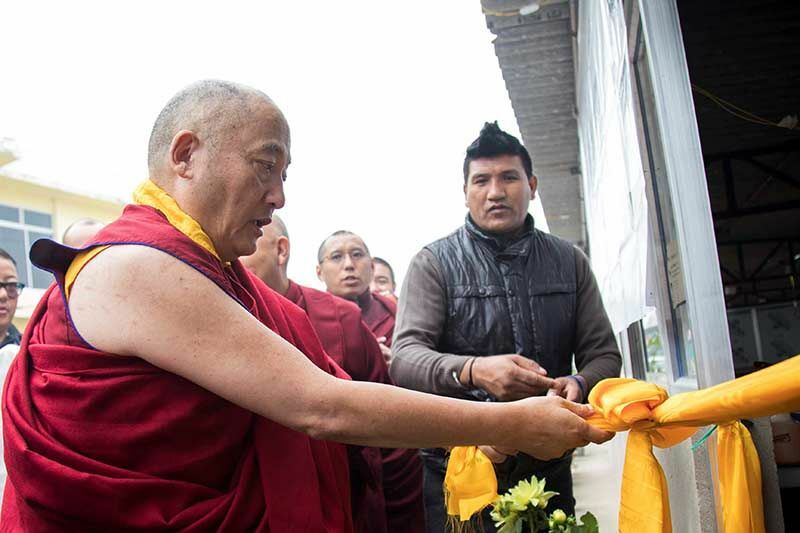 He responded that this fall, Khoryug (his environmental organization) met for the sixth time in Dharamsala, with representatives from the Karma Kagyu monasteries and others as well. 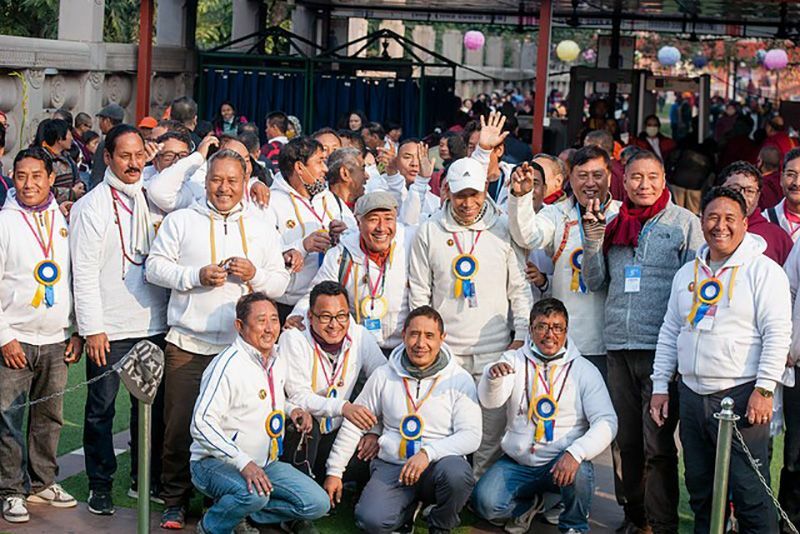 During the Kagyu Monlam, many people gather here, the Karmapa said, and it would be important to make announcements to raise awareness of the environment among the participating monastic and lay Sanghas as well as among the local people and monasteries. Another question was asked about the religious procession that took place after several days of practice. The Karmapa responded that at the end of ceremonies preceding the Tibetan New Year, there is a religious procession that includes an effigy into which all the negativity of the past year has been gathered. Burning the effigy represents consuming by fire all inauspicious and adverse conditions. People send all that is unfortunate into that symbol to be burned away. It is somewhat similar to the Hindu custom from the Ramayana (Ravana-Dahan) related to the demon Ravana: his effigy goes up in fireworks, symbolizing the triumph over evil. 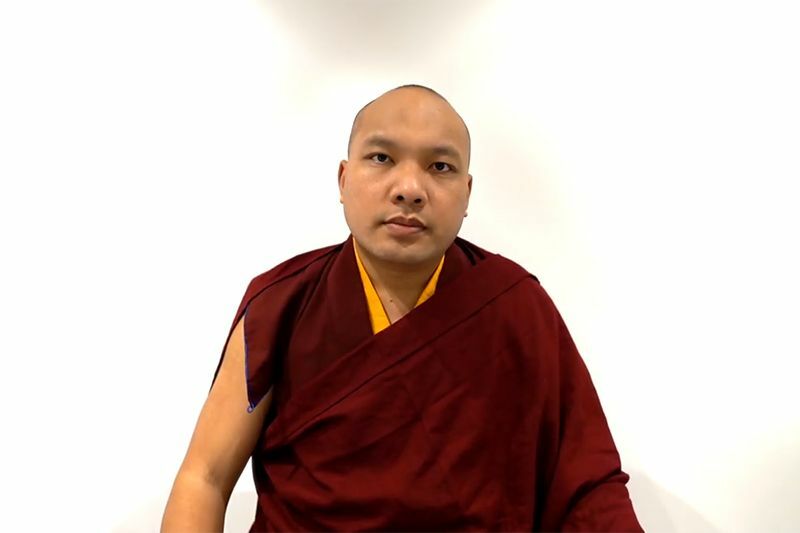 To a question about the future of Tibet, the Karmapa replied that the self-immolations have come to number more than 140, and in looking at this, one can see the situation there is getting worse and more restricted and lacks a climate of accommodation. On the other hand, H. H. Holiness the Dalai Lama is in good health, and the determination and spirit of the Tibetan people is unwavering and stronger than ever. There are also changes happening in China, and given the time we live in, greater changes are imminent. So it is not that we are without hope, and we will continue to make efforts. There is always a window of hope. The Karmapa mentioned that he was especially concerned about the environment in Tibet and added that the whole world should be concerned as well as India and the countries neighboring on Tibet. What benefits or harms Tibet would especially have an effect on India. He felt that this environmental issue was not getting the attention it deserved. The next question was “Would you like to go to Tibet?” The Karmapa responded that of course, one would want to return. Speaking as an ordinary person, when he left Tibet, he had to abandon his parents, friends, and home. From the spiritual point of view, he had to leave behind his monastery and followers, and all those who came to him for advice. Under such circumstances any individual would want to return home. But when and how that could happen he could not even answer to himself, as the situation is not in his hands, so how could he possibly answer the questioner? The final question was about building a hospital in Bodh Gaya, and the Karmapa answered that those involved with the Kagyu Monlam wish from their hearts to express their gratitude to the people and the place of Bodh Gaya. Here it is difficult to find immediate medical care when there is an emergency. In the past and now in the present, we are doing all we can, he said, to provide medical and social services, with medical clinics and a soup kitchen during the Monlam. 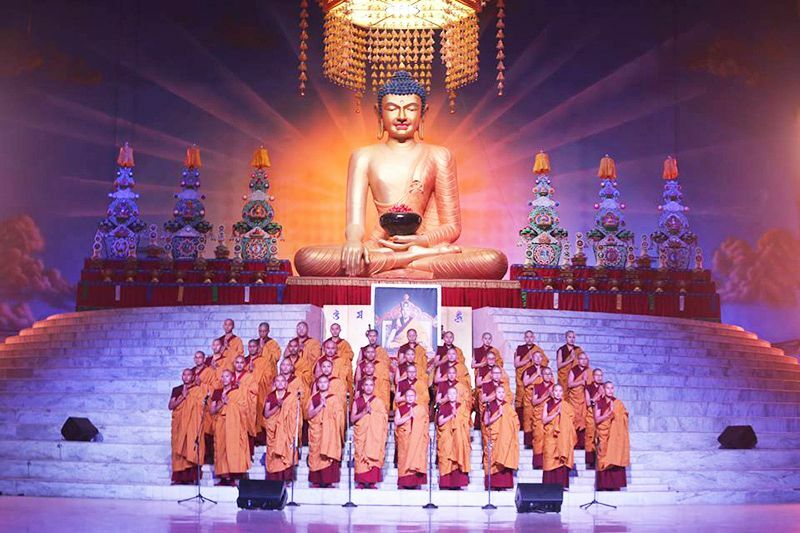 He added that it would be good for the local people to have a well-equipped hospital here in Bodh Gaya. Yet, as you know, there are many preparations that need to be taken care of here in India before one can do anything. We are pursuing this aspiration and hope to be able to express our gratitude in this way and benefit the local people here in Bodh Gaya. 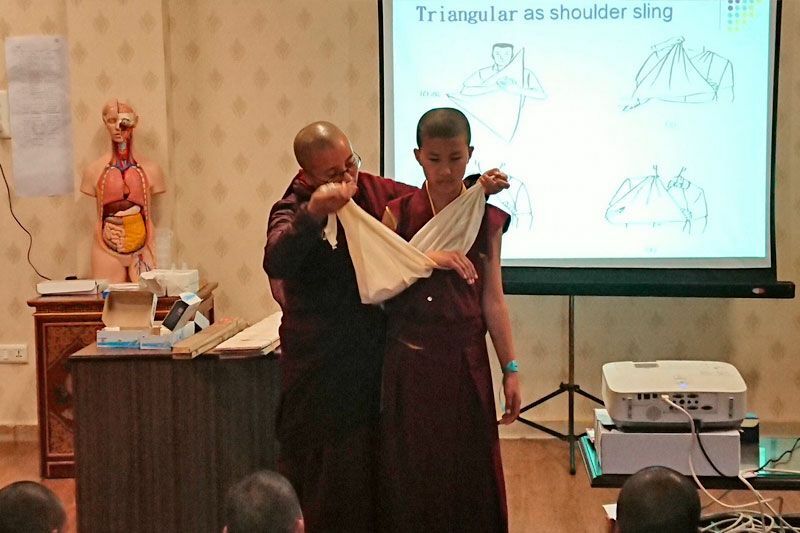 After the Karmapa departed, it was mentioned that a prosthetic leg and calipers camp will take place this March jointly between Tsurphu Labrang (Karmapa's Office of Administration), Max Foundation, and Jaipur Foot.